Dallas native John Matthew “Matt” Stover, or “Stove Top,” the kicker for the National Football League’s Baltimore Ravens, began his 17th year in the NFL in 2006. Starting his career in 1990, he was drafted by the New York Giants in the 12th round, 329th overall, but couldn’t displace Giants incumbent Matt Bahr. He got the kicking job the following year with the Cleveland Browns and has been with the franchise ever since. When the Browns moved to Baltimore and became the Ravens in 1996, Stover made the move and has remained the kicker for the franchise’s entire history, including its Super Bowl XXXV triumph. After being on IR with a quadriceps pull in 1990 as a rookie with the Giants, he has not missed a game due to injury in his career. He enjoyed his best season in 2000, scoring a career and NFL-high 135 points, which earned him his first trip to the Pro Bowl. He capped his outstanding season with a 34-7 win over the team that drafted him, the New York Giants, in Super Bowl XXXV. A Pro Bowl performer in 2000, Stover was the third most accurate kicker in NFL history, owning an 82.7 percent success rate (350-of-423) entering 2005. In 2004, Stover moved into tenth place on the NFL’s all-time scoring list with 1,481 points, and entered 2005 in fourth place on the active scoring list. He also entered 2005 with 262 consecutive PATs, the fourth-longest streak in NFL history. Matt Stover kicked four field goals against the Buffalo Bills, when his Baltimore Ravens played the Bills on Dec. 31, 2006. He finished the season 28 of 30 on field goal attempts. Stover owns the NFL record for consecutive games with a field goal—38 in the 1999-2001 seasons. Going into 2005, he had made more field goals (350) than any of the top five kickers had attempted. He moved into 17th place on the NFL’s all-time scoring list in 2003 with 1,364 points. Stover, who has been in the NFL longer than any other active Raven, moved into the top 20 all-time NFL scorers during the 2002 season. Stover is a willing charitable volunteer. He was named Humanitarian of the Year by the Cleveland TD Club in 1992. He regularly makes anti-drug and alcohol appearances, aids kids football programs, Stay in School campaigns, Boy Scouts, and Youth Charities, as well as makes hospital visits as part of work with the Cystic Fibrosis Foundation. Stover was co-chairman of the “65 Roses Sports Club,” benefiting Cystic Fibrosis. He was a celebrity waiter for the Lung Association, modeled for a Ronald McDonald House benefit, helped raise funds for United Way through “Field Goal Challenge,” which tied Matt’s kicking success with donations from sponsors. He is active in the Fellowship of Christian Athletes and serves on its State Board in Maryland. He spends much of his off-season time delivering his message of hope by giving a number of speeches to church youth groups and schools both in his home state of Texas and his current home in Baltimore. He has worked with high-risk juvenile academic and half-way houses in Texas. He and his wife, Debbie, are involved with Georgetown, Tex., pregnancy centers. Matt and Debbie have three children. Daughter, Jenna Lee, was born in 1995, and son, Jacob Matthew, was born exactly one year later. The couple’s second son, Joe Mark, was born in 2003. The Matt Stover Foundation is active in making charitable contributions to the Baltimore community. The Stovers and the Foundation participated in the All Community Team preseason event and Auction Party, helping to raise more than $200,000 in the silent and live auctions for Baltimore charities. In 2004, the Stovers hosted a private screening of Fat Albert for invited youth from Villa Julie and St. Vincent’s Center. In 2005, his Foundation partnered with Brown Advisory, a Baltimore-based investment firm, which adopted William Paca Elementary School and provided resources for the students. That same year, he received $25,000 from the NFL’s Player Matching Grant, and he gave $10,000 to Johns Hopkins Children's Hospital and $10,000 to Villa Marie. Linking his football skills to his charitable interests, Stover teamed with Pizza Hut in 2001 to donate $500 for every made field goal to the Johns Hopkins Children’s Center. He donated an additional $100 per FG and raised $18,000 for his 30 regular season field goals that year. His continuation of that program through the post-season saw Johns Hopkins Children’s Center receive a total of $20,800. 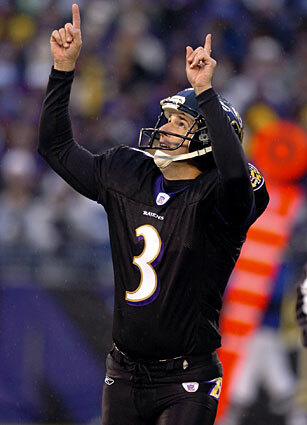 He continued the same promotion during the 2002 season and raised $10,500 for his 21 field goals, and an additional $2,000 was donated by the Matt Stover Foundation. Matt hosted the first annual “Matt Stover Kicking Camp” in 2002 at the Gerstel Falcon Sports Camps. He has been a keynote speaker for the Fellowship of Christian Athletes, a guest conductor at the Baltimore Symphony Rocks event, and a celebrity coach at the Pam Shriver celebrity tennis classic. He traveled to Washington to visit U.S. military personnel injured during Operation Iraqi Freedom, and he has hosted and sponsored an annual outreach for high school students that delivers a message about responsible living. Thousands of students have attended these. In addition to his NFL and charitable responsibilities, Stover is involved with a variety of business ventures. He owns part of a real estate company in Baltimore, is part owner in a construction company, as well as part owner of a Texas-based Internet company. His hobbies include computers, attending plays, coaching, and speaking to youth groups.